Last month saw the release of Star Trek Beyond, the third film in the JJ Abrams / Kelvin / Handsome universe that began with the 2009 reboot and continued in 2013 with Star Trek Into Darkness. Although I was excited for any new live-action media in the Star Trek franchise, I wasn't sure what to expect from this outing. The 2009 film was a welcome and necessary update to the formula, while the 2013 film was mired in too many weird plot devices and allusions. With a new director and scriptwriter, the latter including Simon Pegg ("Scotty"), would Star Trek Beyond prove a fitting closure to what was originally intended to be a trilogy? The family that treks together! Yes. Star Trek Beyond was utterly delightful, with a perfect mix of action and character moments. 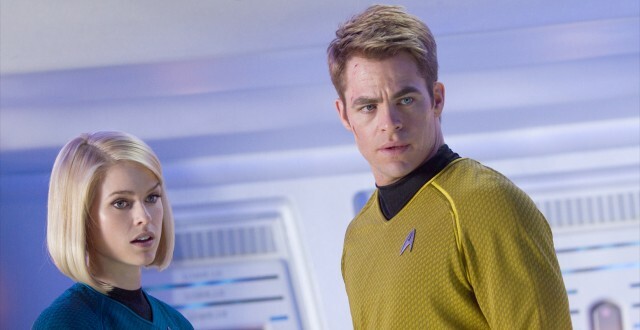 While the 2009 film may've been decried as being too heavy on action, Star Trek Beyond bookends with intense, concentrated action sequences, leaving the middle of the story to focus on pairs of characters: Kirk and Chekhov, Scotty and Jaylah, Spock and Bones, Uhura and Sulu. 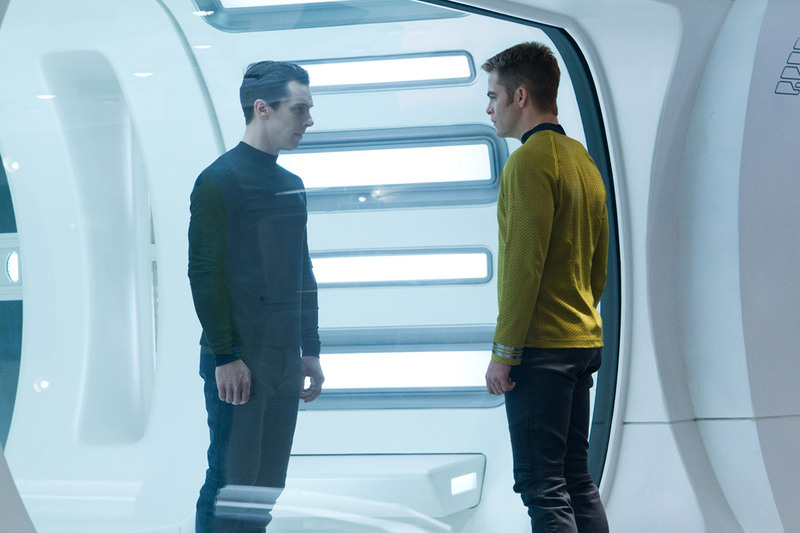 There was none of the stereotypes or pettiness we saw in Star Trek Into Darkness, instead allowing the characters to demonstrate genuine introspection, growth, and camaraderie. On a personal note, I saw Star Trek Beyond opening weekend with the KansasFest 2016 crew. Conspicuously missing was my father, who had passed away just a few months earlier. He's the one who got me into Star Trek in the first place, and we'd seen the last six films together in theaters. 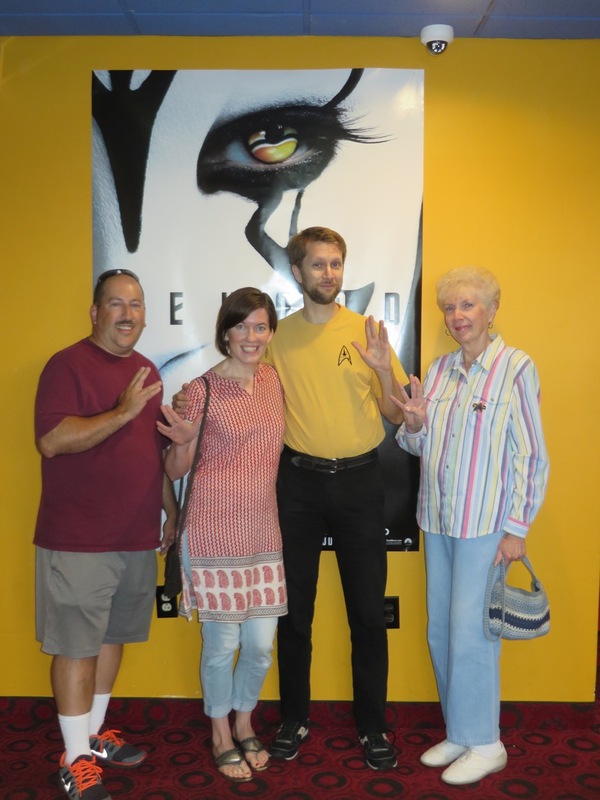 It was tough to sit through this film without him… but a week later, I saw the movie again with my oldest brother and our mom, for whom this was her first theatrical Star Trek outing. Although she's not as mired in Trek lore as some, she nonetheless found the film exciting to watch and was glad she went. There's talk of a fourth film with this crew (though sadly, without Chekhov, in memory of the late Anton Yelchin; and without Ambassador Spock, in memory of Leonard Nimoy). I'm eager to spend the intervening years continuing to bring my mom up to speed in time to better enjoy the Enterprise's next voyage! 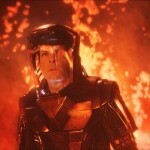 Filed under Films, Star Trek; 6 comments. Four years after J. J. Abrams rebooted Gene Roddenberry's original television show, the youthful crew of the original NCC–1701 have again taken to space in Star Trek Into Darkness. 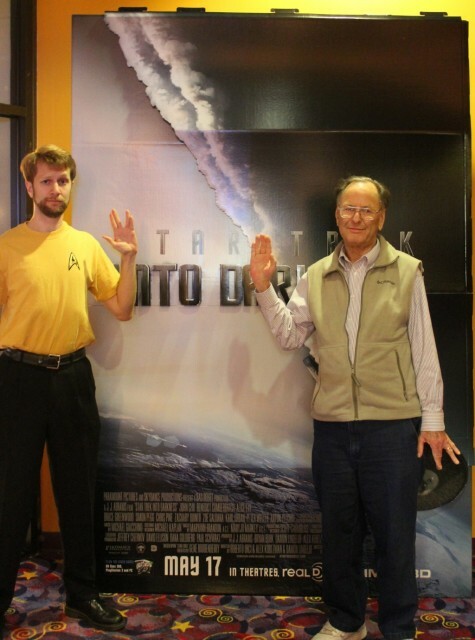 As is now our tradition, my father and I attended the film's opening night. Two hours later, I left the theater feeling a way no other movie had ever left me: overwhelmed. The layers, implications, and consequences of the Enterprise's latest mission are too complex to be boiled down into a simple recommendation. Although I do wholeheartedly recommend this film, it's not enough to say that it's a good film, as it's much more than that. I'd walked into the movie having successfully avoided all trailers, teasers, rumors, and revelations. I cannot promise I will do the same in this review, so proceed with caution. For example, the latest trailer has a single word that would've ruined for me the identity of the antagonist, which some might consider an already poorly kept secret — but even as I watched the film, I was never sure of myself right up until the big reveal. It would be impossible to comment on the film without including that moment. What better way to start a summer blockbuster than with a volcano? More broadly than those specifics, it's important to first acknowledge that this is no longer Roddenberry's Star Trek. 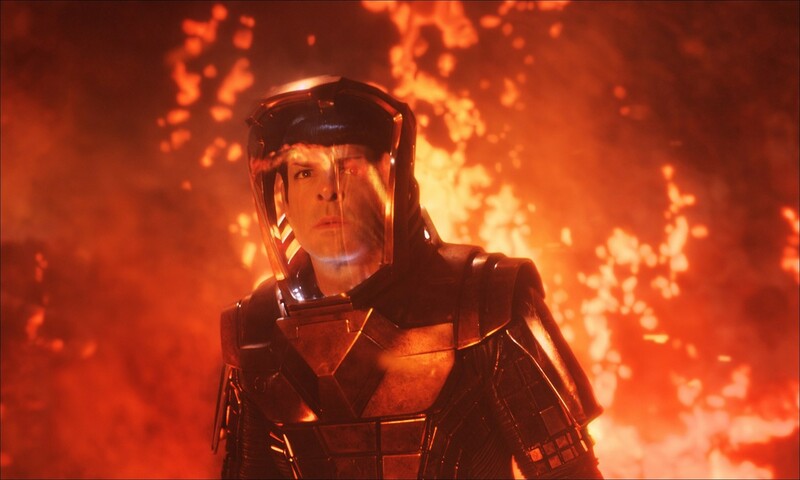 Some have criticized Abrams for dumbing down Star Trek from its ideological origins into a generic action-packed blockbuster. 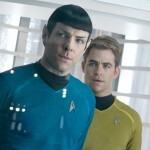 But with these two films, Star Trek has undergone a natural evolution from philosophy defined to philosophy realized. Star Trek is no longer about debates around tables and in turbolifts, as it so often was in The Next Generation, a series I adored. Now it is about making difficult decisions in the heat of the moment — and dealing with the consequences. The most talkative we see this crew of the Enterprise is Kirk's confrontation with Scotty, which does not go the way either Scotty or the audience expected; the look on his face says, "Did we really just pull the pin on this grenade?" Other conflicts, such as Uhura and Spock's spat, seem almost comically timed and forced. But even these moments move the story and the characters forward through challenging times. Just because the set has moved from a conference room to the heat of battle does not make the decisions any less difficult. That gravity is carried by the excellent acting of the cast. Although the credits list the actors in alphabetical order, implying an ensemble cast, it is very much Kirk and Spock's show. Most everyone else gets their chances to shine: Scotty is integral to the plot; Bones and Uhura have some fantastic scenes; and Sulu's moment in the spotlight is the first time I've seen a hint of the man who will eventually captain the U.S.S. Excelsior. Chekov, unfortunately, is mostly wasted in this episode, serving as a poor substitute for Scotty. But the movie is ultimately about Kirk and Spock's friendship and their diametrical approaches to situations, as indicated by McCoy's answer to Kirk's early question, "If you were here, Spock, what would you do?" The returning cast is joined by Alice Eve (Men In Black 3) as Carol, Peter Weller (RoboCop) as Admiral Marcus, and Benedict Cumberbatch (Sherlock) as John Harrison. John Harrison? Yes, that is the name of our villain, at least at first. His early act of terrorism was brutally unwelcome here in Boston, where we had just suffered a similar tragedy. From there, his actions are pettier than I'd expect. His escape to the Klingon homeworld gave us a first glimpse at this re-imagined alien race, but they are otherwise a red herring. Harrison was neither conspiring with them nor enticing the Enterprise into a war with them. Given those missed opportunities, what was he going to do on Qo'noS — hide? It seems an unfitting and unambitious fate for the tyrant he eventually reveals himself to be. Had he succeeded, we might once again have had a movie where Kirk and Khan never come face-to-face — a missed opportunity from the 1982 film, finally realized in 2013. Watch their love explode across the screen! Cumberbatch's character is one of the film's many ties to the known Star Trek timeline. Another is Section 31, the brief mention of which elicited a gasp from this long-time fan. It indicates a familiarity with Star Trek lore, both the unaltered timeline that precedes Nero's incursion — Section 31, although introduced in Deep Space Nine, was alive and well in the age of Captain Archer — and the implications of what it could become in the future. The same occurs with the introduction of Carol Marcus: her introduction to Kirk produced little unique chemistry, but we know what it could become. But no character, alien, or organization carried as much weight as a scene revisited from The Wrath of Khan. Kirk's rescue of the Enterprise came so suddenly that, when I realized what was happening, it hit me like a ton of bricks. "Not again!" I despaired. Leonard Nimoy's Spock had just said that Khan was defeated "at great cost" — a heavy statement: how many people can reflect on their own deaths, then be chilled by the knowledge that their murderer has risen from the grave? Now here we are, seeing it happen again, this time with Kirk as the human sacrifice. The captain who'd started the film with the proud proclamation of having never lost a member of his crew had more than a perfect record in mind; the agony with which he had, moments ago, apologized to the bridge for what he thought was their ultimate defeat was palpable. Kirk cares for every member of his ship as much as he cares for Spock — the latter being a friendship that is no less weighty for having been witnessed across only two films instead of two decades, as it was the last time Khan threatened the Enterprise. Kirk bookends the film by saving Spock's life, and the evolution we see is in Spock's reaction: from a detached betrayal of his captain to Starfleet, to a vengeance-fueled hunt his friend's killer. 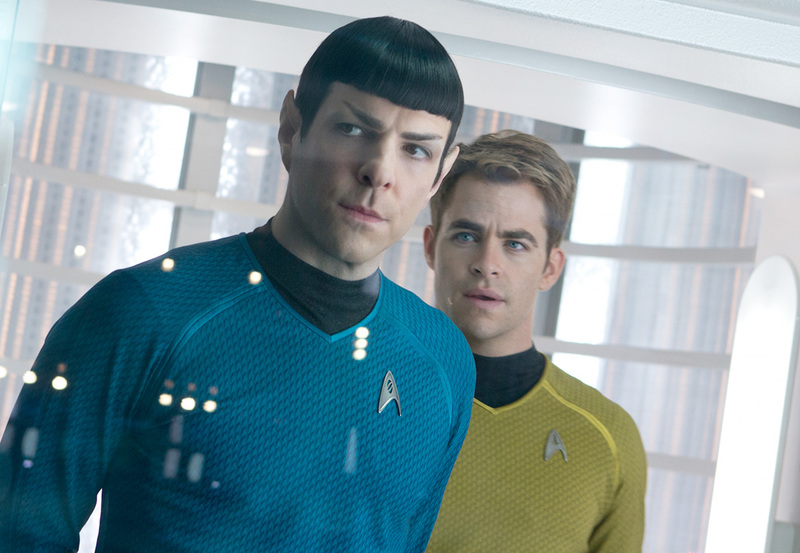 Through Kirk's selflessness, Spock has gotten in touch with the best and worst of his own humanity. Watch their love explode across the screen!… or not. 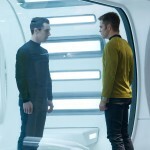 This scene, combined with using Khan as the film's protagonist, may suggest an unoriginality among the scriptwriters. Four years ago, Khan seemed the least likely candidate for the sequel, lest Abrams walk the same cinematic path laid out in decades past. But critics clamoring for this new generation of Star Trek to go on an original adventure need look only four years to the past, when the Romulan Nero arrived on the scene. By contrast, this sequel is not a rehashing of an old plot but rather a brilliant exploration of destiny. How much of these characters' fates are their own to decide? Are Kirk and crew destined to always clash with Khan, no matter how much the circumstances may change? Just how far-reaching are the effects of Nero's destruction of Vulcan? The exhumation of the SS Botany Bay is a small change with dramatic consequences. Will the next film continue referring to the pivotal moment in time when a villain from the future set a new course for the galaxy? With the full weight of Star Trek's history behind this movie, it is hard for me to say if this sequel is as much meant for a general audience as the 2009 reboot was. You can get away without knowing what Section 31 is, or who Carol Marcus becomes — but is Khan a good villain on his own merits? There is no reference to the Eugenics Wars, which may be too much backstory for one film to deliver, lest it become the preachy Trek it is trying to move away from. Not only his origin, but also his ambition, may be lost on an audience that is not as likely to respond to Khan's identity with "Holy crap!" than they are with "Who?" For those filmgoers who take this film as just another summer blockbuster, there's still plenty to enjoy on just that level, and plenty to gripe about, too. As with any Trek (or even sci-fi in general), there are plenty of plot holes and technological inconsistencies. Some were elegantly addressed: when I wondered how Khan could beam himself to Qo'noS, they tied back into the 2009 film with a reference to Scotty's transwarp beaming technique, a direct result of Nero's temporal incursion. But then the question becomes: why send the Enterprise to Qo'noS when they could just beam there? Of course, the choice to plot a course into enemy territory furthered Admiral Marcus' agenda, but it still seems an oversight. Also, I think the film may've addressed this, but is within an explosive device the smartest place for Khan to have hidden his family? And, even if the Eugenics Wars was two hundred years ago, shouldn't at least one member of Starfleet have studied enough history to recognize the leader of the Augments? Or was plastic surgery part of Khan's transformation into John Harrison, that he might work alongside Section 31 without revealing the depths to which Admiral Marcus had plumbed for inspiration? Still, most other scenes can be neatly explained. Marcus sharing the secret of Section 31 with Kirk seemed a faux pas, but I suspect Marcus never expected Kirk to come back from his next mission, taking the truth of the clandestine group's existence to his grave. The explosion of the 72 torpedoes first seemed heartless and cruel, especially given McCoy's involvement — what happened to "First do no harm"? When Kirk learned that the Augments had been extracted, his response took the words right out of my mouth: "I'll be damned." And the use of Khan's blood to save Kirk (which has its own implications for the future of Star Trek — is there anything Augment blood can't cure?) was foreshadowed not only by the tribble's resurrection, but also by the cure for the diseased girl, which was likely a dose of the same elixir. And sure, we knew Kirk wouldn't die, not so early in Pine's career in the role. But if only the admirable Pike had been afforded so heroic a death, or at least the peaceful one we can assume he was granted in the original timeline, rather than gunned down in cold blood — even if the latter was necessary to provide Kirk the drive to go after Harrison. Whatever level you view this film on, it has special significance for its core audience. For someone who has seen all 726 episodes and 12 movies and read dozens of novels of Star Trek, I cannot take what J.J. Abrams has done here lightly. It is a powerful combination of fan service and creative license — a message of "I will use what you like, but you may not like how I use it." I almost cannot render judgment without seeing what comes next. Will Abrams continue to rely on the familiar, remixing it in unexpected ways? Or will he contribute something wholly original to the Trek universe? In a sense, he has already gone boldly, with his direction and pacing of this action-packed sequel. What more lies far beyond the stars for the Enterprise and her fans to discover? I am not a runner, nor will I ever be. Give me a bicycle and I'll give you a metric century, but pounding the pavement is not a sport for me or my knees. The only way I'll ever experience the challenges faced by my masochistic brother and cousin, both competitors in the annual Boston Marathon, is vicariously, such as by watching the movie Run Fat Boy Run. The experience was more relatable than I expected: like a marathon, the film has plenty of painful buildup, but the ultimate payoff proves worth it. The movie opens on the wedding day of one Dennis Doyle (Simon Pegg), who, faced with the prospect of a lifetime commitment, turns and runs, leaving his pregnant fiancé, Libby, at the altar. Pick up five years later, when Doyle is a bum of dad living in a basement apartment when he isn't an ineffectual security guard at a lingerie store. For him, this is apparently a satisfactory arrangement — until Whit (Hank Azaria), a successful financier, arrives to sweep Libby off her feet. Suddenly jealous, Doyle vows to win back the woman he jilted by showing he can do anything Whit can do — including running a marathon. Unlike five years ago, he just has to hope this time he's running in the right direction. I'm not above "stupid humor" (I highly recommend Dude, Where's My Car? ), but it's not what I was hoping to find in Run Fat Boy Run. As such, the first half of the film was disappointing, laden as it was with puerile jokes regarding body parts and fluid. But about halfway through, Doyle suddenly realizes that this race isn't a joke, and that there is in fact something important at stake. What we're then given is a film that loses none of its lightheartedness as it shifts its focus from simple comedy to being about priorities, introspection, family, and amends. Most important, the film emphasizes not just the physical demands of running a marathon, but also the mental challenge. There's much more to running than just putting one foot in front of the other — if there wasn't, anyone could do it, and anyone can't. Doyle encounters some significant obstacles in his path not just to the finish line, but also to the starting line, and whether or not he surmounts these hurdles, the film makes his abilities, limitations, and decisions entirely believable. I've been avoiding Simon Pegg films, wanting my first exposure to the actor to be his portrayal of Scotty in the upcoming Star Trek film. I broke that abstinence this past Halloween when I succumbed to the thoroughly enjoyable Shaun of the Dead. In both comedies, Pegg plays a character that has a surprising degree of authenticity, which encourages my faith in his ability to play more serious roles. It's like watching Will Ferrell's evolution from Elf to Stranger than Fiction, or Jim Carrey from Ace Ventura to The Truman Show. Though Hank Azaria first registered on my sensors due to his work on The Simpsons, he's since made a name for himself apart from his voice work with movies like like Godzilla and Tuesdays with Morrie. In Run Fat Boy Run, he initially comes across as a perfect American — fit, friendly, and financially sound. But his mature appearance hides an insecurity that eventually bubbles to the surface, presenting a balanced contrast to Pegg's own character development. The more I think about this film (especially its latter half), the more I like it. 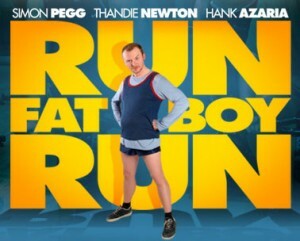 Although the presence of the marathon suggests a situational comedy, Run Fat Boy Run ultimately a character-driven one, which is an essential ingredient to any critically successful film. I would've had a hard time seeing this movie in theaters, since I occasionally relied on the DVD's subtitles to translate the British accents, but I can wholeheartedly recommend it to anyone willing to put up with some potty humor on the way to something more sincere.